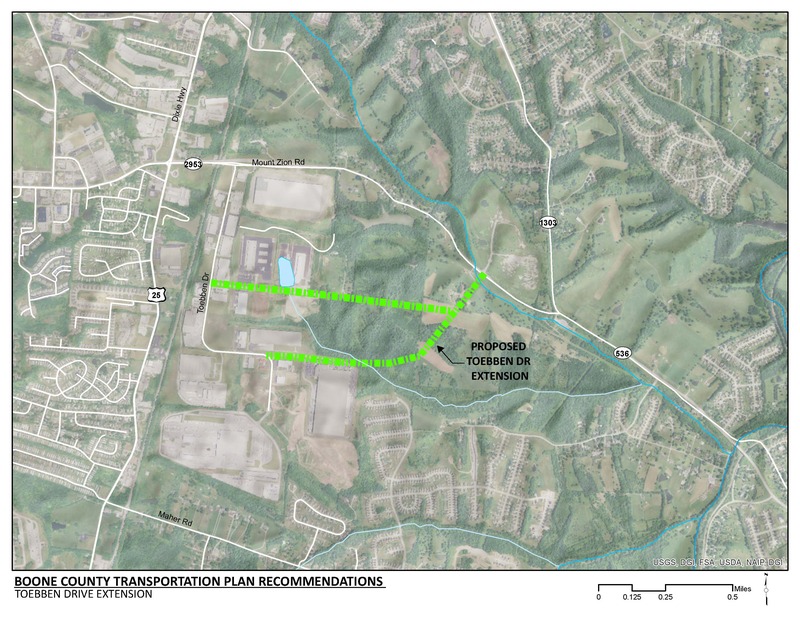 Extend Toebben Drive east and northward to connect with KY 536 in Kenton County to address capacity and support economic development. Extend Fleet Lane to connect with new extension of Toebben Drive. Install a multi-use path along the new roadways. This project will provide a second means of access into and out of this industrial area for freight deliveries and employees. The introduction of a circular means of accessing industrial facilities supports potential, future transit service for thousands of employees. The project will create additional acreage for future industrial development. Dedicated multi-use paths will provide pedestrian and bicycle accommodations for employees and connect to other proposed pedestrian and bicycle facilities in the area. This supports Boone County’s goal of improving safety and connectivity for bicycles and pedestrians. Click HERE for a map of multi-use paths in Boone County. Due to the rolling terrain east of the Boone/Kenton county line, an extension of Toebben Drive directly east to KY 536 will require a large amount of cut and fill to support the road and facilitate appropriate drainage. Therefore, multiple alternatives will need to be considered to reduce the project cost. The map included in this overview is provided as a conceptual planning recommendation to initiate discussion. The project may require crossing the unnamed stream that runs south of KY 536 one or more times. Coordination between Boone and Kenton Counties will be important for funding and implementation of this project. The project will require coordination with the Kentucky Transportation Cabinet’s KY 536 widening project. Existing Toebben Drive serves several industrial facilities that generate significant truck and employee traffic. However, there is only one access point to KY 536 for both truck and vehicular traffic. The KY 536 intersection with US 25 (Dixie Highway) is approximately 1,100 feet west of the KY 536 intersection with Toebben Drive. The westbound KY 536 queue of traffic sometimes extends near or past Toebben Drive. As a result, vehicles existing Toebben Drive must wait through several US 25/KY 536 signal cycles to turn left, creating an additional queue of traffic on Toebben Drive. Vehicles that wish to turn right from Toebben Drive are blocked by the queue of traffic on Toebben Drive that is waiting to turn left. Toebben Drive serves several existing industrial developments. There are no pedestrian facilities along existing Toebben Drive or Fleet Lane. TANK route 22X stops at the US 25/KY 536 intersection. In the past, with FedEx funding, TANK operated bus service directly to the FedEx Ground facility located at the southern terminus of Toebben Drive. Unfortunately, an insufficient number of employees utilized this TANK service, so FedEx financial support was terminated after one year.